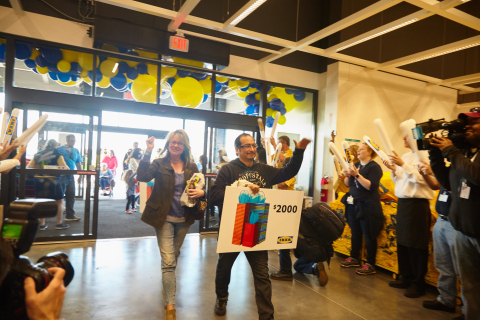 OAK CREEK, Wis.--(BUSINESS WIRE)--IKEA, the world’s leading home furnishings retailer, today opened the doors of its Oak Creek store to customers at 9 a.m. CDT. Before the doors opened, Store Manager Samantha Gravina, Oak Creek Mayor Dan Bukiewicz, the Swedish Embassy’s Head of Public Diplomacy, Monica Enqvist and IKEA U.S. Senior Vice President Anton van Dongen were present to welcome the community with a traditional Swedish log-sawing ceremony, bringing good luck to the new store and its guests. Throughout the day, shoppers will be greeted with family-friendly events, special offers and thousands of dollars in gift cards—including three (3) gift cards valued at $500, $1,500 and $2,000 that were given out during the opening ceremony. Throughout the entire day, visitors who join IKEA Family or scan their IKEA Family card in-store at an IKEA FAMILY kiosk, info tower, tablet or during checkout, will also be automatically entered for a chance to win a $250 IKEA Gift Card through the IKEA FAMILY loyalty program. Winners will be randomly drawn every hour during store open hours. The 290,000-square foot IKEA Oak Creek is the first IKEA store in the state of Wisconsin and boasts one of the largest rooftop solar arrays in the state. The store’s 225,000-square-foot solar array consists of a 1.63 MW system and is built with 4,716 panels. It will produce approximately 2,046,000 kWh of electricity annually for the store, which is equivalent to reducing 1,678 tons of carbon dioxide (CO2), the emissions of 326 cars or providing electricity for 228 homes yearly (calculating clean energy equivalents at www.epa.gov/energy/greenhouse-gas-equivalencies-calculator). This installation will represent the 52nd solar project for IKEA in the U.S., contributing to the IKEA solar presence atop 90% of its U.S. locations, with a total generation of more than 42 MW. IKEA, drawing from its Swedish heritage and respect of nature, believes it can do good business while minimizing impacts on the environment. In addition to the solar array, IKEA Oak Creek co-workers have begun to volunteer in the community, most recently donating thousands of dollars in furniture and furnishings to the Boys and Girls Club of Kenosha. With IKEA Oak Creek now open, there are 416 IKEA stores in 49 countries, including 48 in the U.S. Since its 1943 founding in Sweden, IKEA has offered home furnishings of good design and function at low prices so the majority of people can afford them. IKEA has been included in rankings of “Best Companies to Work For” and strives to be an employer of choice. IKEA incorporates sustainability into day-to-day business and supports initiatives that benefit children and the environment. For more information see IKEA-USA.com, @IKEAUSA, @IKEAUSANews, or IKEAUSA on Facebook, YouTube, Instagram and Pinterest.